Edited 1 time(s). Last edit at 08/09/2016 05:16PM by parasole. Edited 1 time(s). Last edit at 08/10/2016 08:09AM by parasole. Also they don't say what web interface it has, if indeed there is one. AFAIK there isn't a web interface for any Marlin variant yet - please correct me if I am wrong. Edited 2 time(s). Last edit at 08/11/2016 06:55AM by dc42. So, it is based on Marlin as core code for printing itself with added functionality which is very good add on. Yes the drivers can handle a lot of current... but that is totally wasted if you can't provide more than 12V to the stepper drivers, because motors large enough to need more than 2A need more than 12V too. Even Nema 17 motors need more than 12V on some machines in order to achieve high travel speeds without loss of torque. Only small 3D printers use 12V power these days. 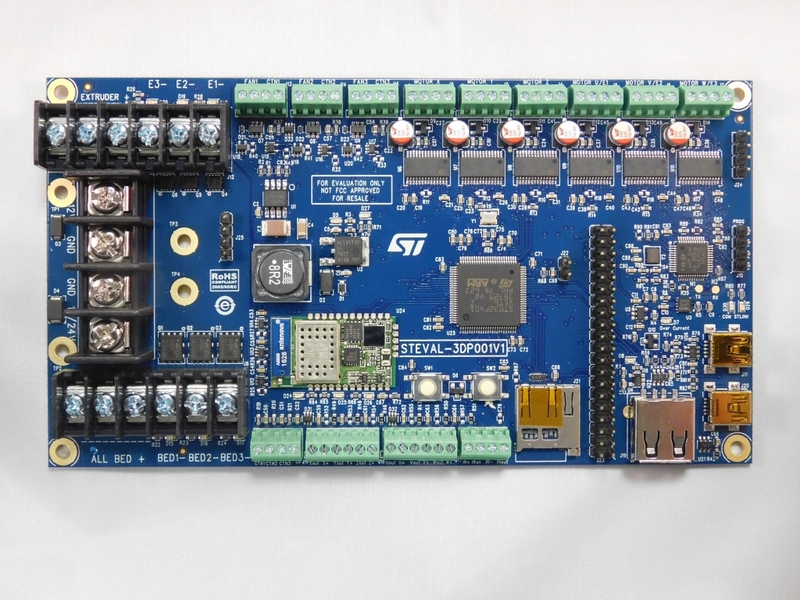 It's nice that it has 6 stepper drivers on board - perfect for driving a Diamond hot end, although it and the multiple bed heater support does make the board rather large, judging by the images. It is interesting to see a major microcontroller manufacturer trying to get into the 3D printer market, with a competitively priced board. As they are new to the field, I guess we can't expect them to get everything right first time. To be fair to them, it's probably intended as a reference design rather than as a board to sell in large numbers. Edited 3 time(s). Last edit at 08/11/2016 03:53AM by dc42. ... I'm using STM32F4Discovery boards with proprietary firmware and software for laser engraving, CNC-milling and as a sort of XY-servo-laserscanner. That is interesting, any chance to share the project or you want to use it commercially? I've used it in the last 4 years for developing lasercutting/-engraving applications and helped the developer to remove some "quirks" in the software -- and have good contacts to them. I've made a port of Teacup to a Nucleo F411RE. This works currently very nice. The Nucleo has the same Header as the Arduino Uno. So for a first test I took a CNC Shield V3. This don't have any voltage divider for thermistors or mosfets for heaters, but you can easy drive four steppers. For heaters and thermistors I made a simple breakout-board. All-in-all costs < 25€ (plus stepper drivers maybe from your current project). Edited 1 time(s). Last edit at 08/13/2016 03:36AM by Wurstnase. Edited 1 time(s). Last edit at 08/13/2016 08:49AM by parasole. Anything should work. But not tested on a real printer. Datasheet on first page tell us " Up to 77 5 V-tolerant I/Os", then note 4 after table 8 for pins definition explains about FT pins, FT = 5 V tolerant except when in analog mode or oscillator mode (for PC14, PC15, PH0 and PH1). Important to mention that they are 5V tolernat only as digital I/O, not when configured as analog input. Edited 2 time(s). Last edit at 08/13/2016 11:04AM by parasole. Current port is only the F411RE. Maybe later the 446 with little more power. Operating the PS_ON pin of an ATX power supply is an example which requires 5-V-tolerance. Just read something about open collector. This could be also a very interesting thing when using mosfets, because it can power any normal LL mosfet with 4.5V+. Nice! No mosfet driver or similar. Thanks for the hint. Currently I'm using a CNC Shield V3. Only for the heaters and fans I need an extra breakout. I will check the circuits. Would this also work on a NUCLEO-F767ZI board?